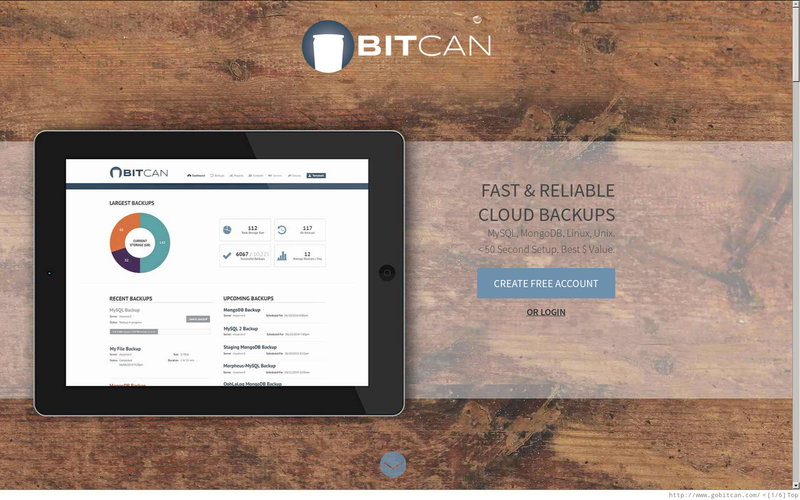 BitCan’s thoughtful design takes away the hassle of making backups and helps you rest easy when it comes to ensuring your data is safe. 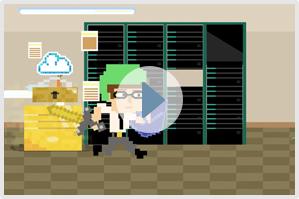 You can backup your files, directories, databases (SQL and noSQL) quickly and easily. You’ll appreciate BitCan’s control panel for its ability to intuitively define new backups and see the results of your most recent backups at a glance. 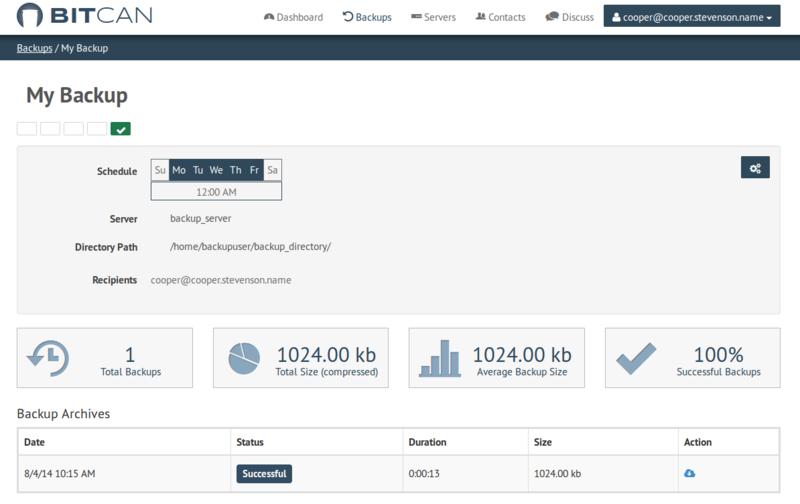 You may also view your backups' size and execution details through the BitCan control panel; when you think of what a backup system should look like, this is it! BitCan uses proven secure shell (SSH) public/private key encryption technology to ensure reliable and secure backups. SSH’s flexibility means that you can back up your servers wherever they are to BitCan’s backup facility. Have thirty servers in the US and 10 servers in the UK? 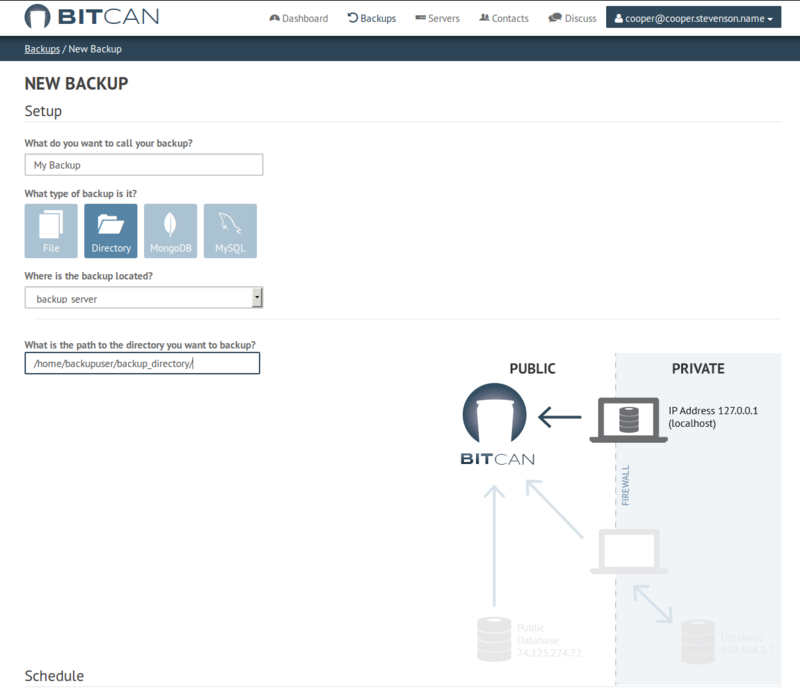 No problem—you can back up each and see their status centrally through BitCan. This guide provides you with step-by-step instructions for creating a directory backup to quickly get you started. The guide covers the creation of your account, defining your servers, creating your backups, and checking for proper completion. Let’s get started! Point your browser to http://gobitcan.com. You will be greeted by the login screen. 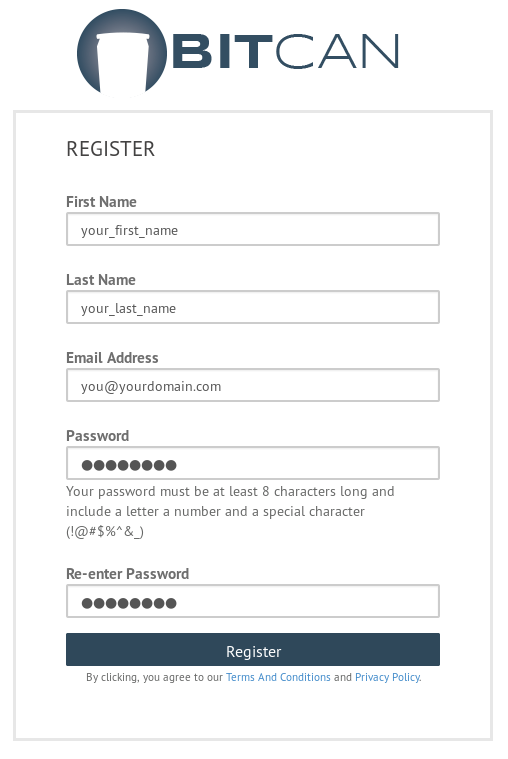 Select Create Free Account and fill in the fields with your contact information. 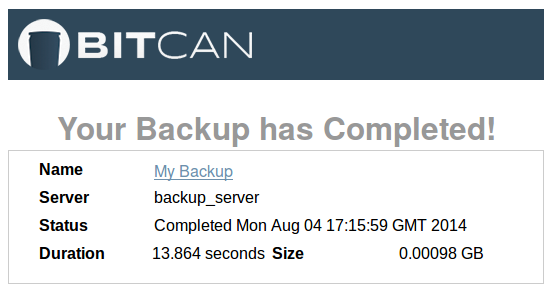 BitCan uses this information to send you updates on your backups' status. The system will welcome you and send an email confirming your registration. Activate your account through the link provided in the email. A user by which BitCan accesses the server. Prepare the backup user’s environment for SSH keys. An SSH key from BitCan. The SSH key configured for the designated user. If you are using an existing user to make your backups and that user has the appropriate permissions to backup the target directories, you may safely skip steps 1 and 2 above. Add Backup User. Note: Some distributions do not automatically add a dedicated group for the user with the adduser command. 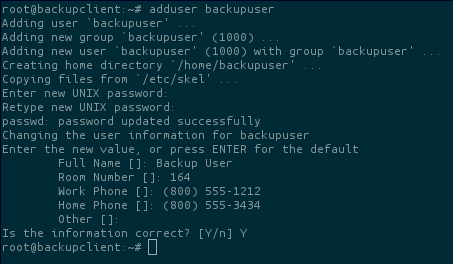 If this is the case, add a backupuser group or include your backup user in a group having permissions to your target backup directory as appropriate. 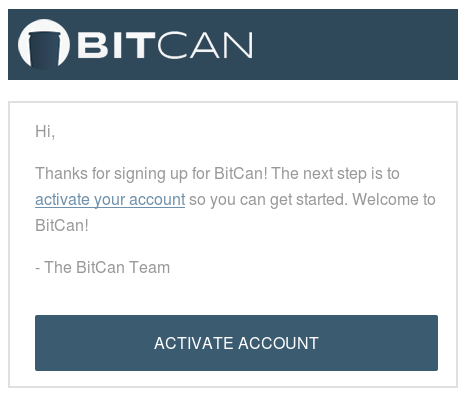 BitCan sent a verification email when you created your account. Let’s access that email now and click the link labeled, activate your account. The link will take you to the BitCan Dashboard. Click the Create Backup icon to create your new directory backup. Create the name for your backup in the text field. Select Directory for the type of backup you wish to create. Select --- Create a Server --- from the drop-down dialog box. Enter a human-readable value for Server Name. BitCan makes it easy to refer to your various servers through meaningful server labels. Enter either the IP address or host name for your server. Note that if you enter an IP address you may need to change this value later if the IP address of the server changes. If you use DNS, make sure that the DNS name always refers to the same server or that you modify this value in the future accordingly. Enter the port number that you wish for BitCan to send commands to your server. 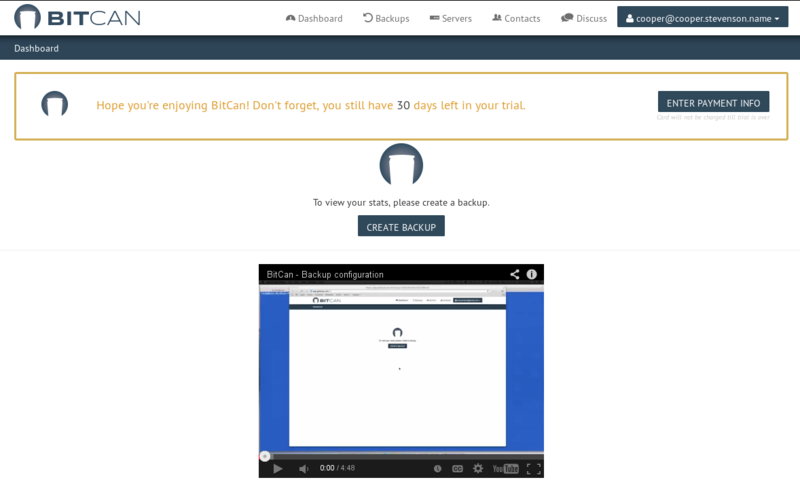 Enter the User Name BitCan will use to communicate with the server. This user name must have at least read and execute permissions to properly backup the directory structure. Important: Whatever port you use, make sure your firewall permits communications to this server from the Internet through this port. This entails both that the port is open and that it translates (NAT) to the target server’s IP address. Append ~/.ssh/authorized_keys with the contents of the key copied earlier with your favorite editor. Ensure permissions are correct (600). From the NEW BACKUP page select the Directory icon. Select the server you created a from the ---Select a Server--- drop-down list. Enter the directory you wish to have backed up in the File to Backup text entry field. In the Schedule section, click the days you would like your backups to happen. Enter your email address in the Recipients field. Creating A New Backup. Note: You can enter multiple recipient addresses here during the initial backup creation or later by editing your backup job through the backup control panel. Once you’ve successfully created your backup, the system will take you automatically to the Backup Control panel. 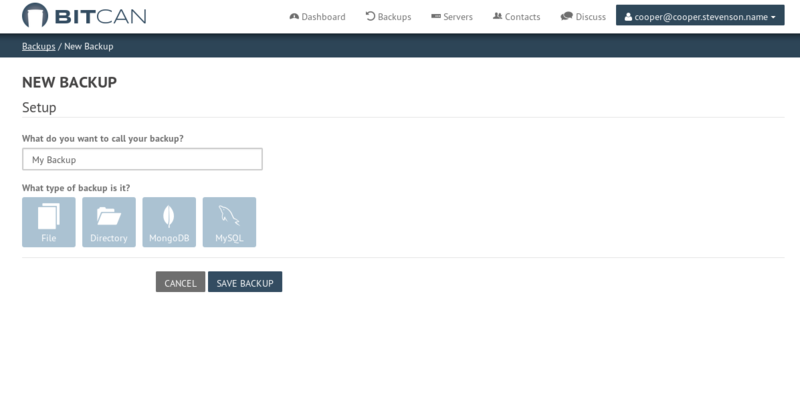 The panel gives you status information for each of your backups at a glance. You can see your backups' success rate, size, number of backups executed, etc. Consider making this control panel your browser’s home screen to see the status of your backups every morning. 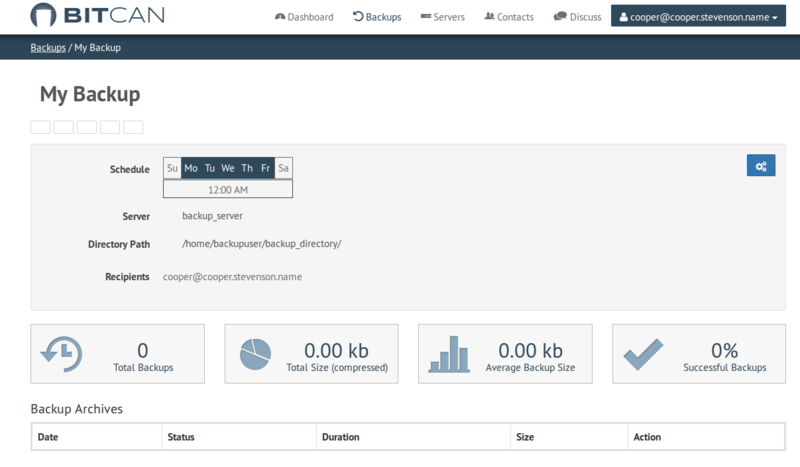 Click the link to your backup from the Backups page, shown as My Backup in this example. Click the gears in the upper-right of the screen. Select Backup Now from the drop-down menu. The backup will begin immediately. BitCan will send a notification email after the backup has finished. You can see that BitCan’s backup status now shows a green check mark just under the backup’s name. This lets you see at a glance the status of your most recent backups. 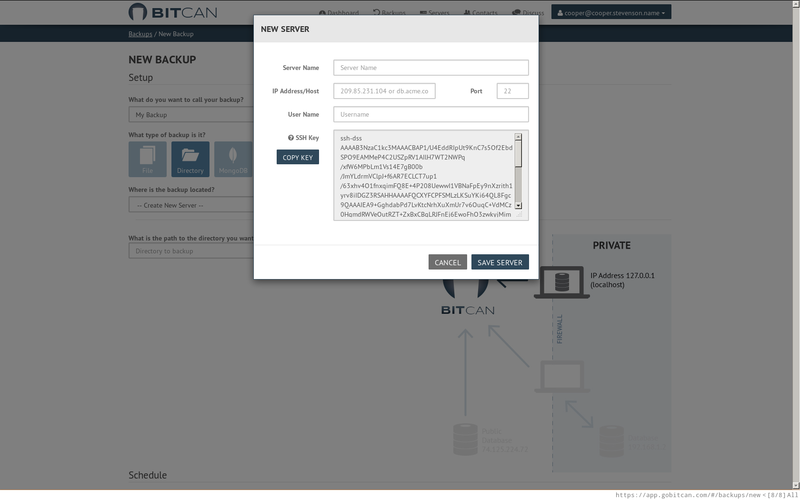 Congratulations, you’ve created your first backup with BitCan!